Last night we saw a screening of About Time. I wasn't sure what to expect, all I knew about it was what I read on the poster above. But I like all of the movies that were mentioned, so I figured what the heck. We met the boys parents for dinner, at Sammy's, one of his favorite places. They do have excellent pizza. The boys parents just came back from a cruise and New Orleans, they had a great time and a ton to tell us about. We actually had not seen them since August, so it was good to catch up with them and celebrate the boys birthday finally. 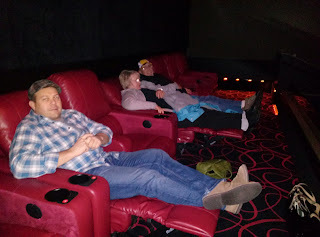 Plus, we went back to the theater with the really comfy seats, let me tell you, that is the way to watch a movie! So comfy. In fact, so comfortable that the boys mom even fell asleep! I really like Rachel McAdams anyway, but this was such a cute movie, with a really sweet story line and just enough twists to make it unique! It is definitely a love story, but a love story on so many different levels. 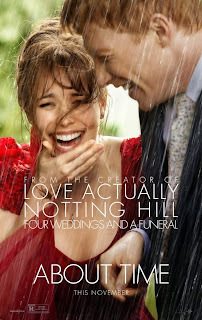 I had not seen Domhnall Gleeson in anything else before, but I really enjoyed him, the chemistry between he and Rachel, was just perfect for the story line. I would definitely recommend seeing this film, it is a chick flick, just so that you know what you are getting yourself in to, but an enjoyable one. And if you can find a theater with really comfy recliners, well, that is even better!